A hearing for Colorado cannabis retail chain Sweet Leaf, whose business licenses were suspended after December raids, has been postponed until March, and more arrests have been made. The Sweet Leaf hearing in front of the Denver Department of Excise and Licenses was scheduled for Jan. 12, but the company has been granted a continuance until March 14. According to documents obtained by Marijuana Business Daily, Sweet Leaf’s lawyers requested the continuance, citing the sheer amount of evidence involved in the case. Meanwhile, two more of the company’s budtenders have been charged with misdemeanors, according to the Denver District Attorney’s office. That brings to 15 the number of Sweet Leaf employees who have been arrested for allegedly selling too much marijuana in multiple sales to the same customers. 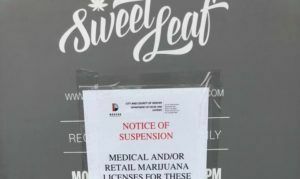 The Dec. 14 raid resulted in the closure of Sweet Leaf’s Denver-area retail stores and suspension of 26 of the company’s business licenses, including cultivation facilities. Sweet Leaf continues to operate two retail stores in Denver suburbs as well as its Portland, Oregon, outlet.